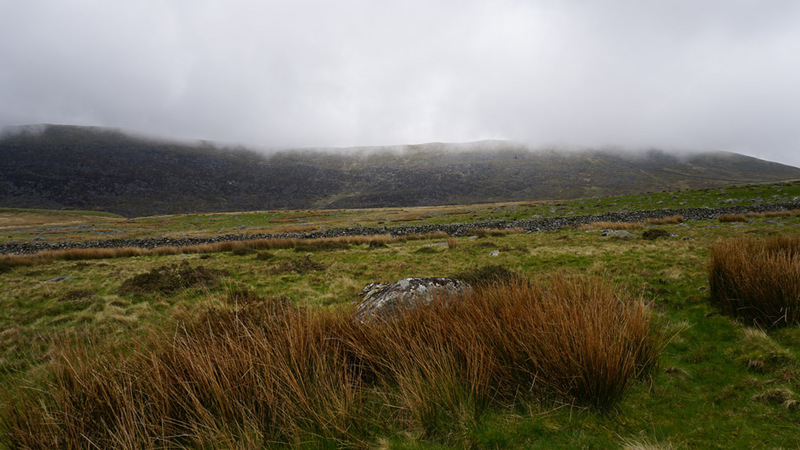 ← Back from aborted Snowdonia Region 2+1 day Solo Walk! 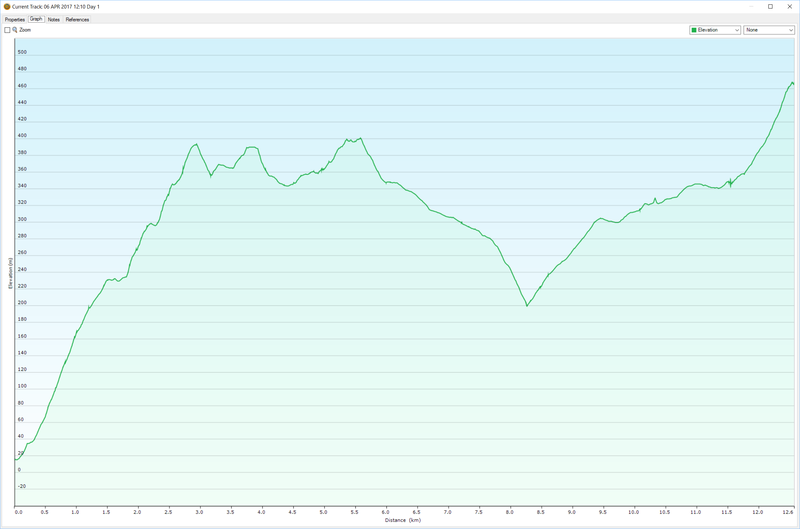 Day 1’s walk of 12.6 km with 765 mtrs ascent and 317 mtrs descent. Given that this was my first walk in a long while, the whole route had a lot of slack built into it. The full route covered around 40 km – a distance that I’d normally do in two days, but given the lack of recent on-the-ground-time I decided to allocate 3 days for this one. Three days would work out fine as the first and last days would each have a 5 hour train journey in them, with the latter requiring a relatively early appearance at the target train station. 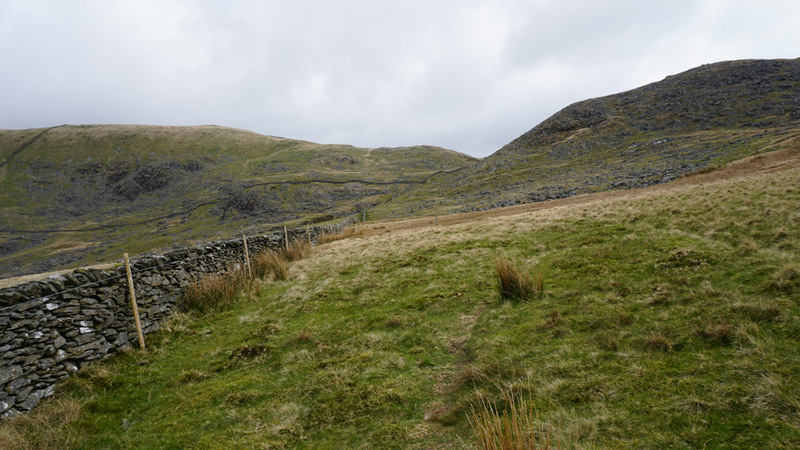 The walk was pretty hilly and like most walks I have done it starts with a hill climb! Primarily to ask why my feet got so badly blistered. 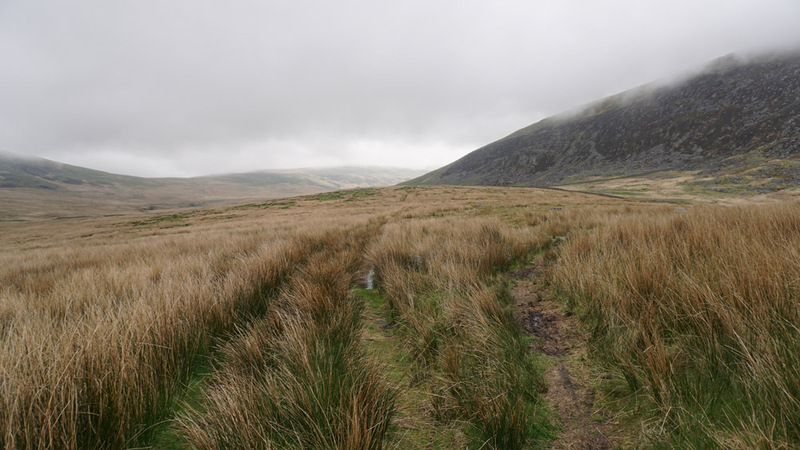 Whilst the boots do take the lion’s share of the blame, I believe that on reflection, it was my drive to get to the first camp spot by LLyn Irddyn. This drive had clouded my judgement and had perhaps prevented me from noticing the gradual deterioration of my feet until it was way too late. One of the hardest things when hiking solo is being objective and maintaining general awareness. Both of these take considerable effort, especially if one is fatigued or hell bent on achieving some kind of objective. The lesson I have taken from this is to not ignore pain from any part of the body, especially the feet. Any discomfort should be investigated and rectified at the earliest convenience. I can’t help thinking that if I had stopped when my feet first became sore, I might have been able to do something about it with plasters etc. But alas, my focus on getting to the camp spot seemed to override all sensibilities. 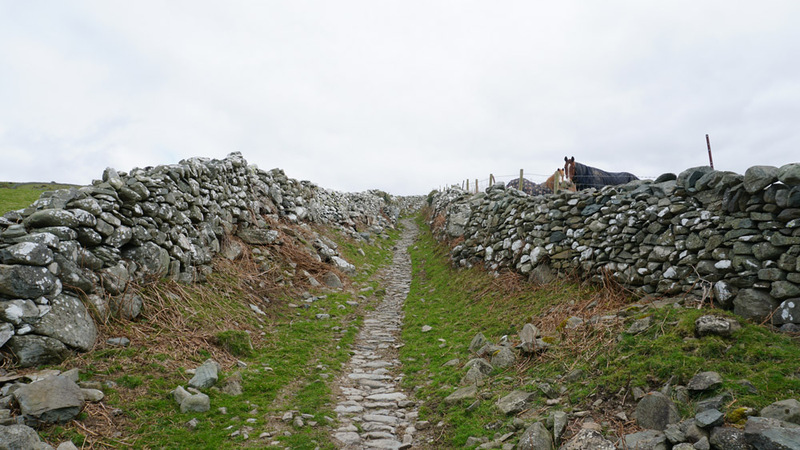 Apart from the feet, the one other major characteristic of this walk was the extensive stone wall networks in the area. 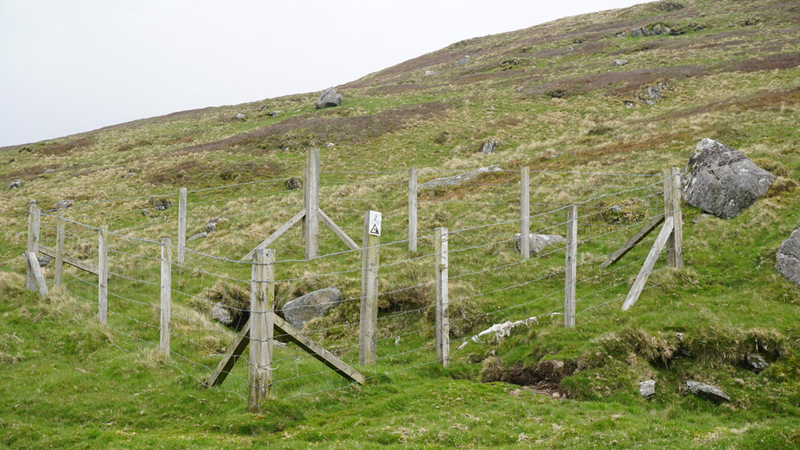 Many are tall and topped with barbed wire. Access across their boundaries are far and few between which heavily constrains ones options in terms of routing. 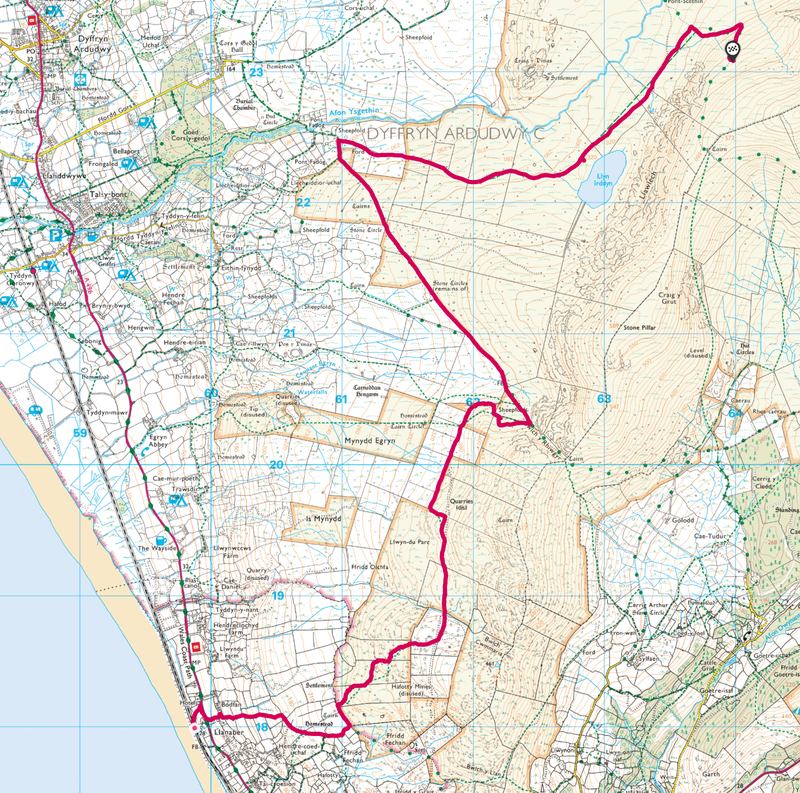 There were occasions where navigation was hampered by Ordnance Survey’s (OS) maps not showing these boundaries accurately. I can remember thinking at the time that I’m glad it wasn’t foggy, otherwise my map could have got me in a pickle on more than one occasion. Given that stone walls are relatively static and that OS has access to aerial photography, I can see no excuse for inaccurate maps. 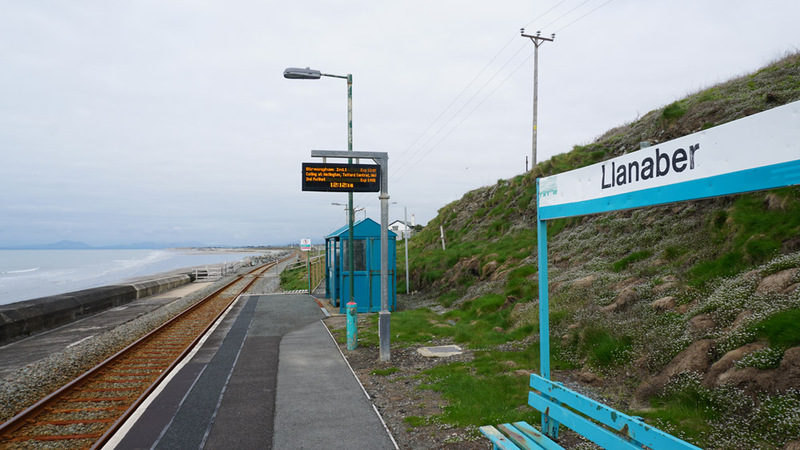 After five hours on the train I finally make it to LLanaber station. 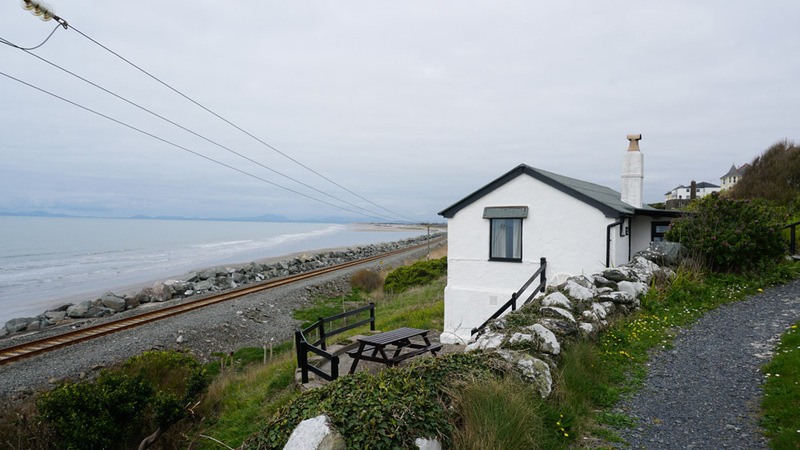 The station has a picturesque view as it is right on the coast of Cardigan Bay with its extensive beaches. Once on the road by the station, I know that I need to hang a right. The trail that I’ll need is just to the left of the building up ahead. The climb is now on! 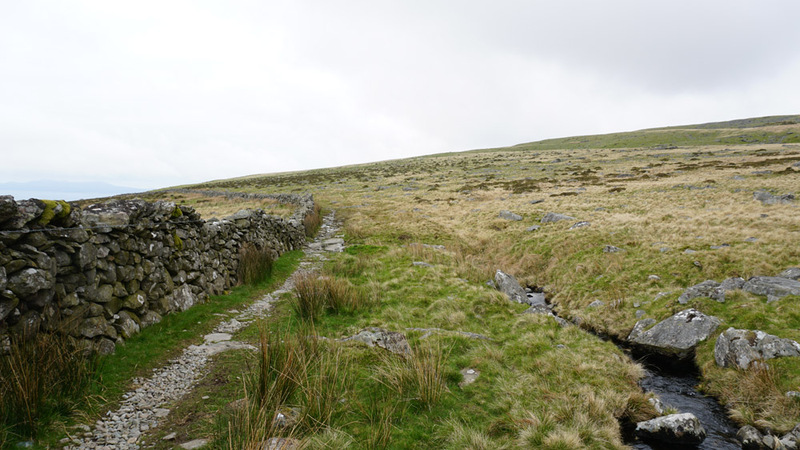 This part of the walk is constrained by walls on both sides which makes navigation a breeze. Despite the lack of walks I have been doing recently, the 5km lunchtime training walks have paid off. I was genuinely surprised at the overall ease of the hill climb. 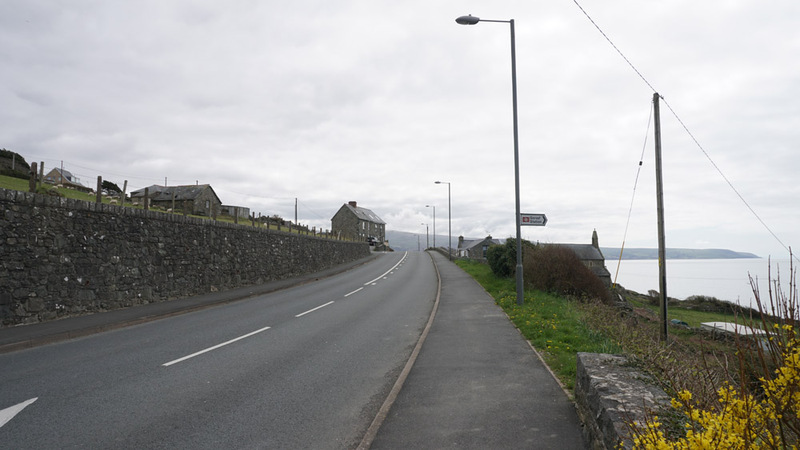 This is the view to the South toward Barmouth. 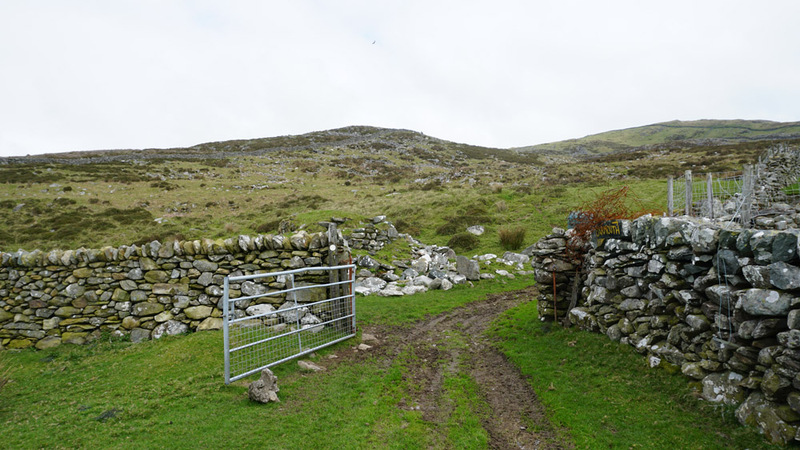 I eventually get to this gate which marks the boundary into National Trust areas. From here on in I am no longer constrained within the walls of the track. However, I do have other constraints imposed by the maze of walled fields! 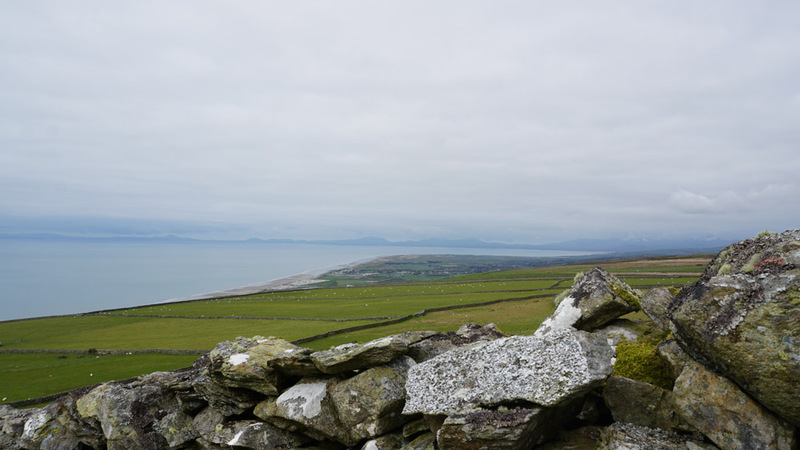 The view Northwards up Cardigan Bay. This looks like a good place to be if you enjoy your beaches! 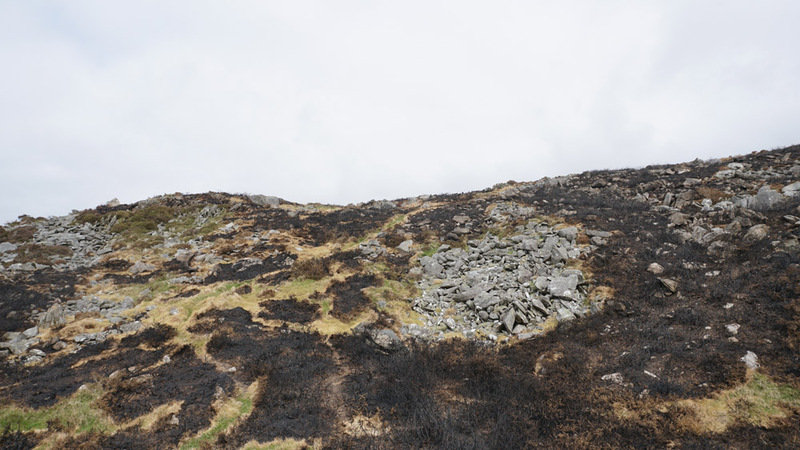 As I proceed higher up there is evidence of burnt heather. 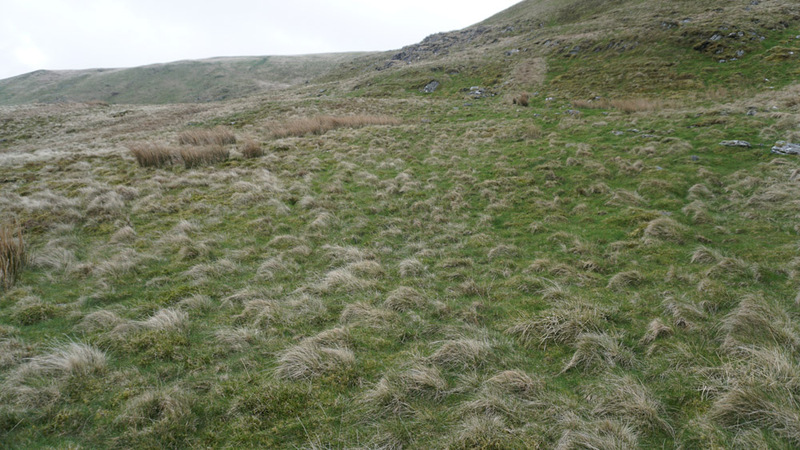 I’m not sure if this is as a result of land management or an accident. It does smell relatively recent though. For the most part navigation was pretty easy as the trail was easily discernible. The real cross country walking would have taken place on Day 2, but alas, it was not to be. Kit load out was pretty standard and weighed in at a little under 15 Kg. At this point my feet were sore, but I wasn’t paying much attention to them. 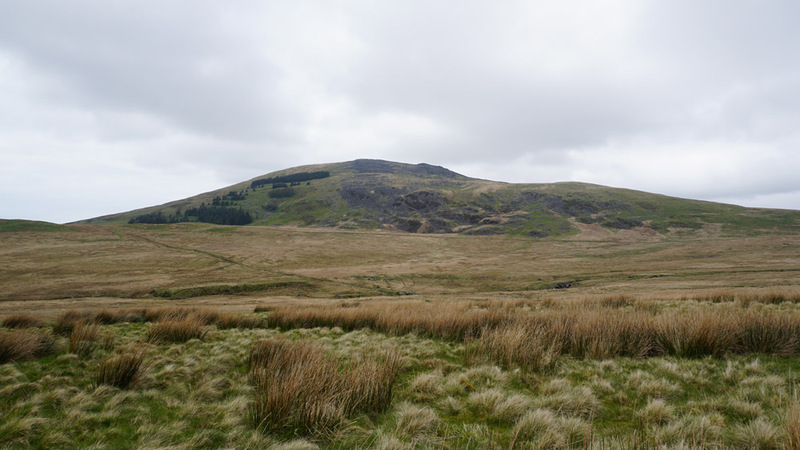 My sole focus was on reaching Llyn Irddyn – the planned camp spot for this day. 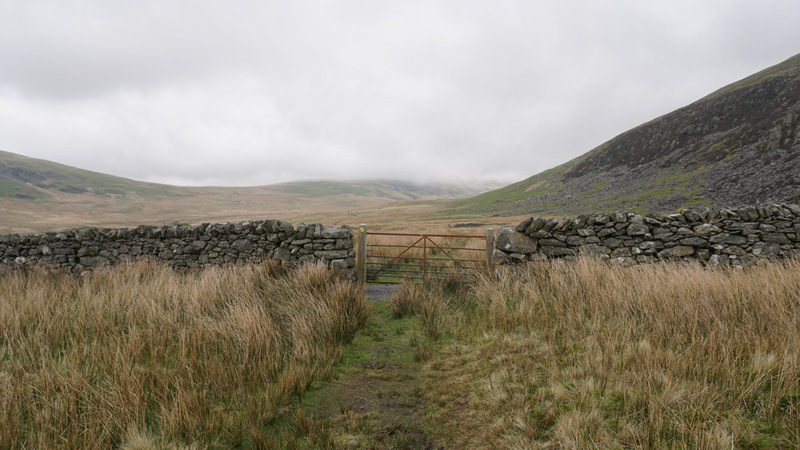 Up ahead were the hills of Bwlch Cwmmaria. 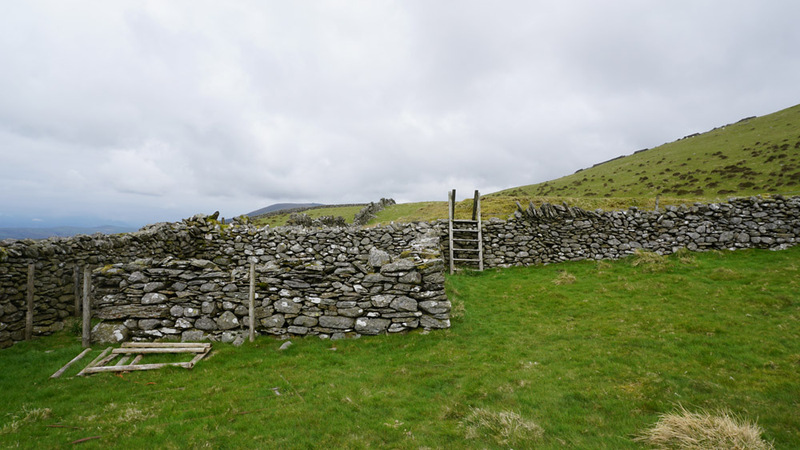 I would have liked to climb them for the trig points, but this part of the hill has many walled off areas with no means of traversing them without having to climb – not something I wanted to do as one can damage the walls and possibly themselves when doing this. 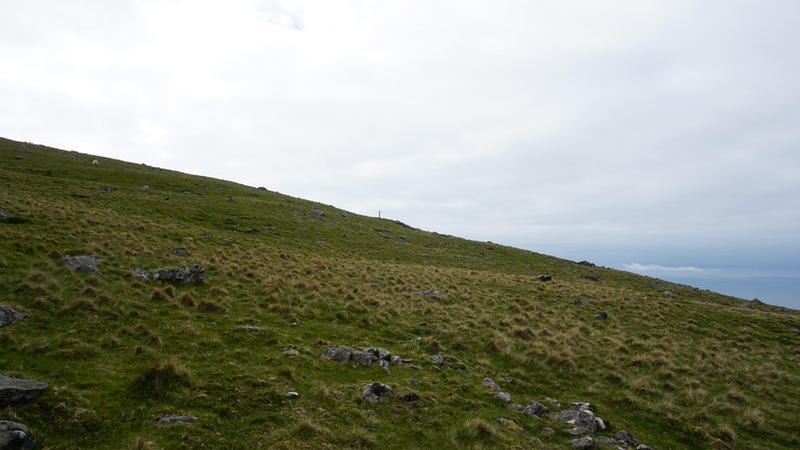 I soon arrive at the first high point of today’s journey which provides a good view of the trail headed Northward. 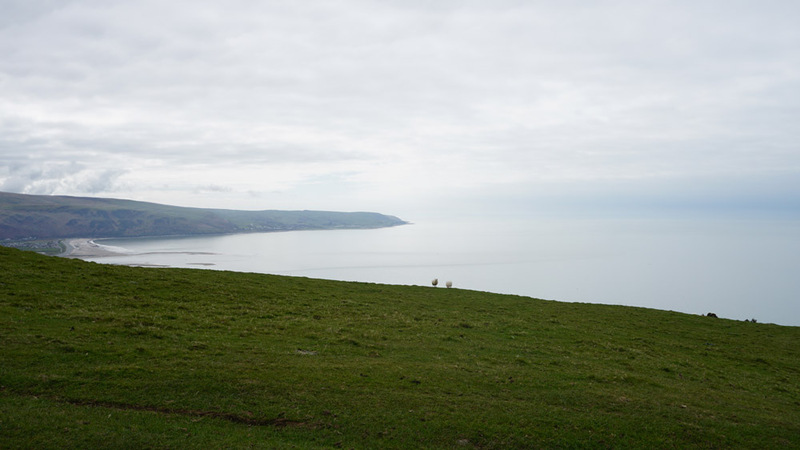 It’s always handy to eyeball terrain features when you get a panoramic view like this as it helps with the navigation when you are in amongst it! 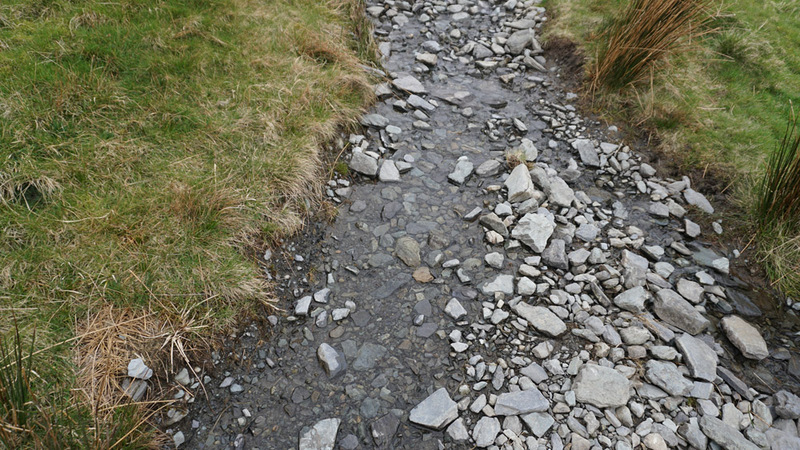 After crossing the wall I’m relieved to see the stream as water supplies were starting to run low! 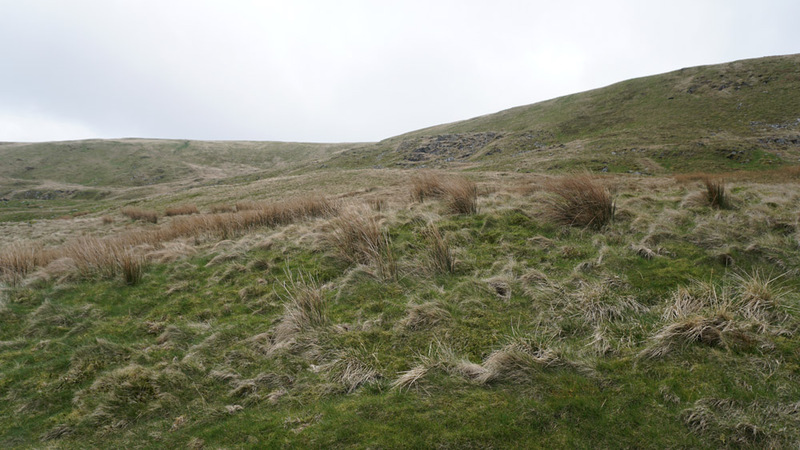 This whole area has many fenced off areas like this one warning people of subsidence – presumably from old mine-works. The sign shows a man falling down a hole. 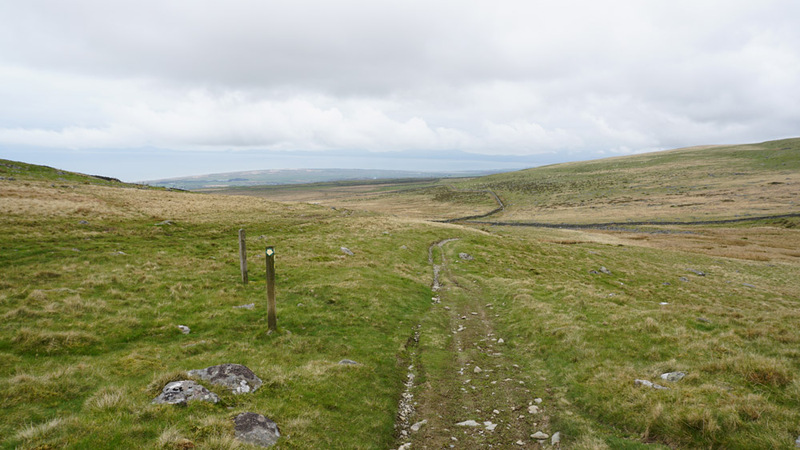 Far to the North I get the first glimpse of Moelfre – the characteristically shaped hill centre left. There are many sheep here. 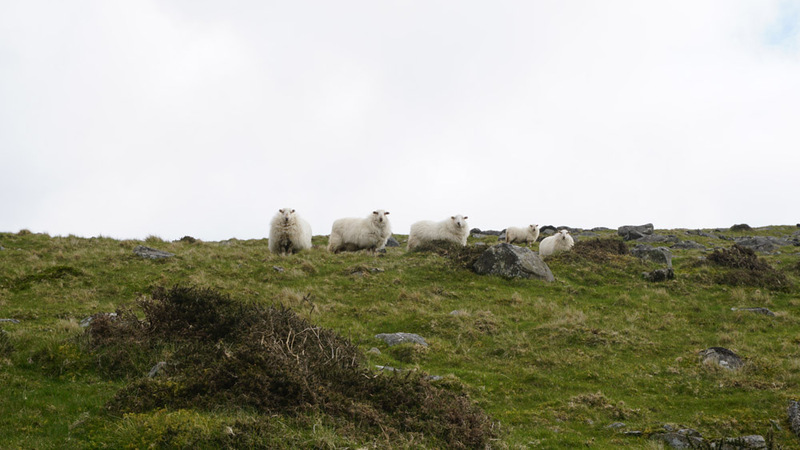 Normally sheep run away at the sight of a hiker, but these ones seem genuinely curious! I spend a good 5 minutes here trying to work out the best way across the wall on the left. According to my map there should be a way through the wall at this corner, but it isn’t there. To be fair, the digital map is modified in that it now shows the trail going to that corner and terminating. At first I think I’m in the wrong place because of the maze of walls in this area. But various compass checks prove I’m where I should be. Behind me I spot a wooden pole in the distance. This is a marker to the trail. I had ignored it as that route is marked with green dashes on the map which means ‘Public Right of Way’ rather than a trail. 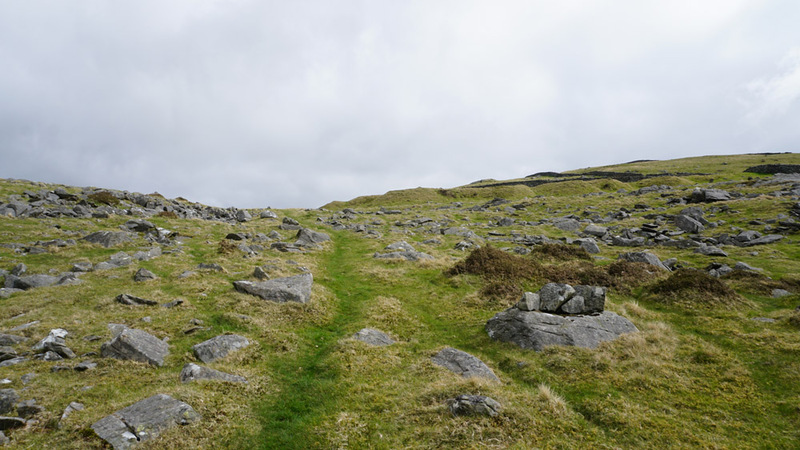 In my experience, the green dashes often bear little resemblance to any trail (not a mapping fault – as these are showing rights of way – not trails). 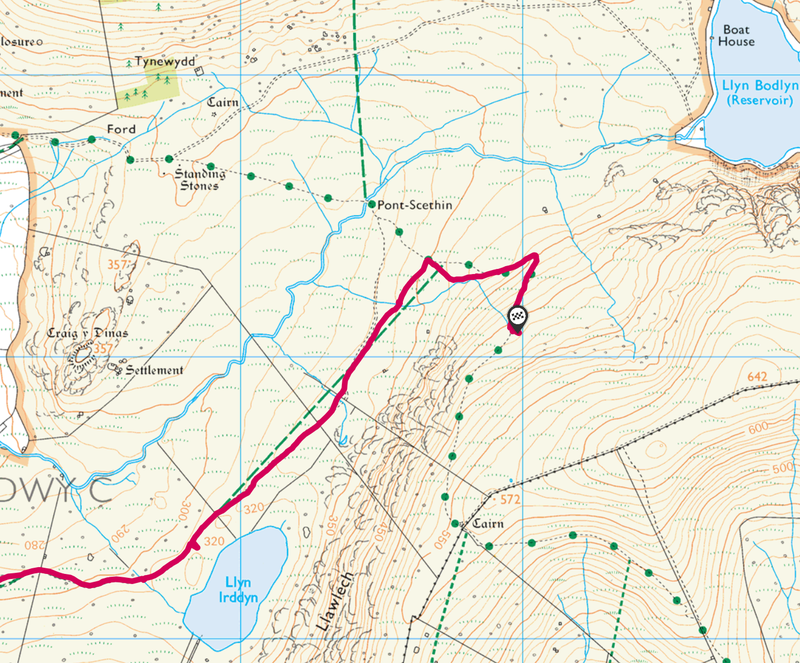 Instead, over the years, I have learnt to look of for the actual trail markings on the map – the much fainter black dashed lines. This case proved to be the odd one out where the green dashes were the ones to follow! 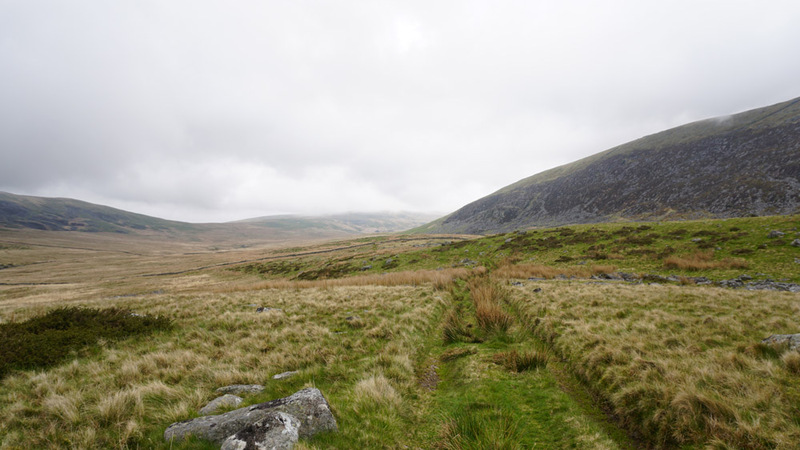 In many respects I wish OS would either remove the green markings, or change them to follow the actual trails in the area – that way they would be far more useful. 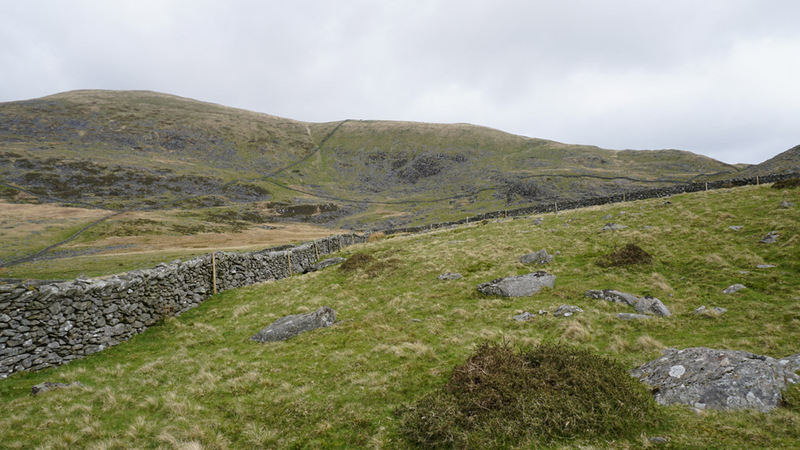 To get over the wall on the left I have to hand rail it up the hill towards the Bwlch y Rhiwgr pass up ahead. 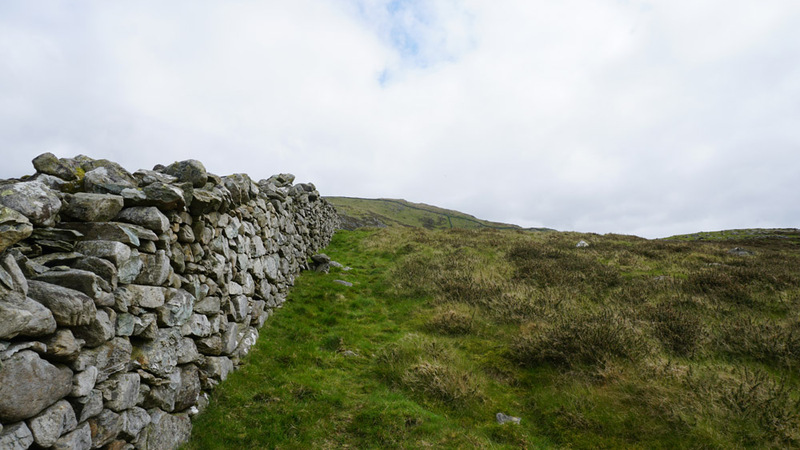 There should be a means across the wall where it crosses a bridle way originating from that pass. However, I have to take a little diversion away from the wall to get around a deep bog – the dark brown area between the camera and the wall. I finally get to the gate that will allow me through the wall. 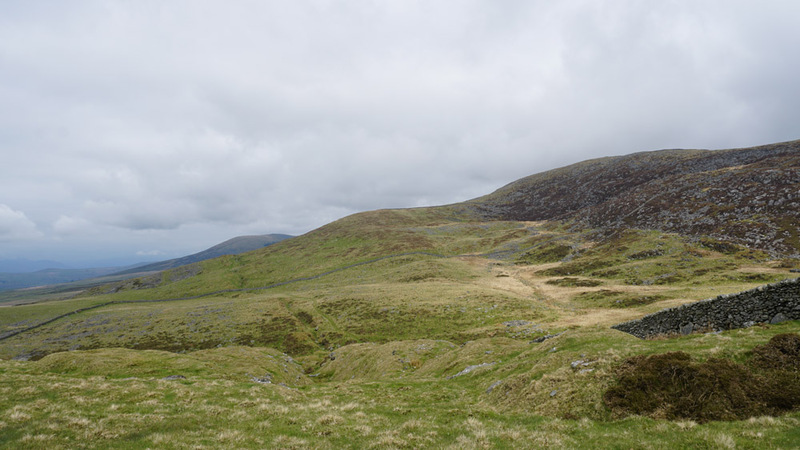 The next stage of the walk is all down hill. It’s just a case of following this trail until I get to its end at around 2 km. There is a parallel track on the left. 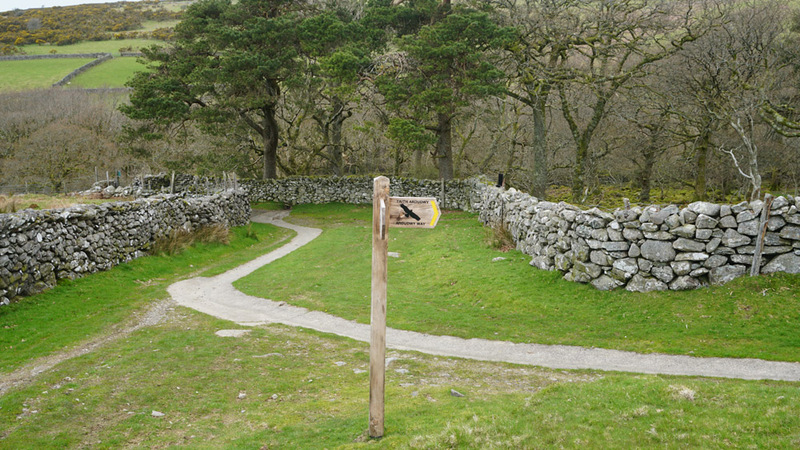 Luckily the land owners have done a good job in sign posting the trail. As a result I need to cross over to the track on the left. 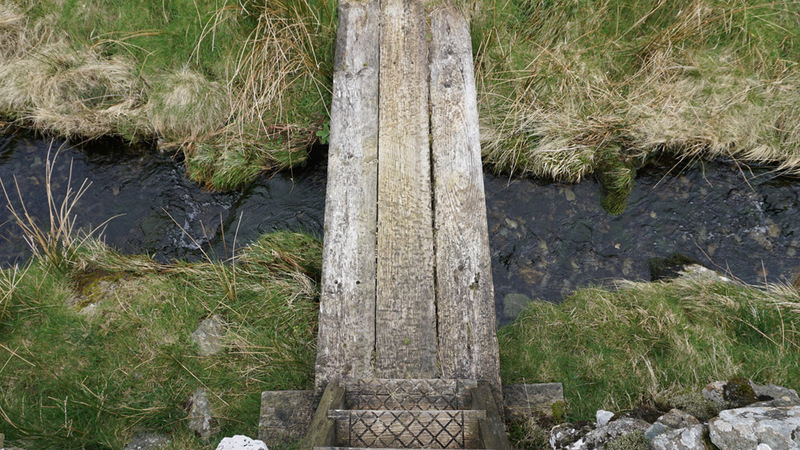 There aren’t too many walls to count on this part of the journey, though one does get the occasional feature like this stream which passes under a stone foot bridge up ahead. These features allow one to accurately gauge progress. 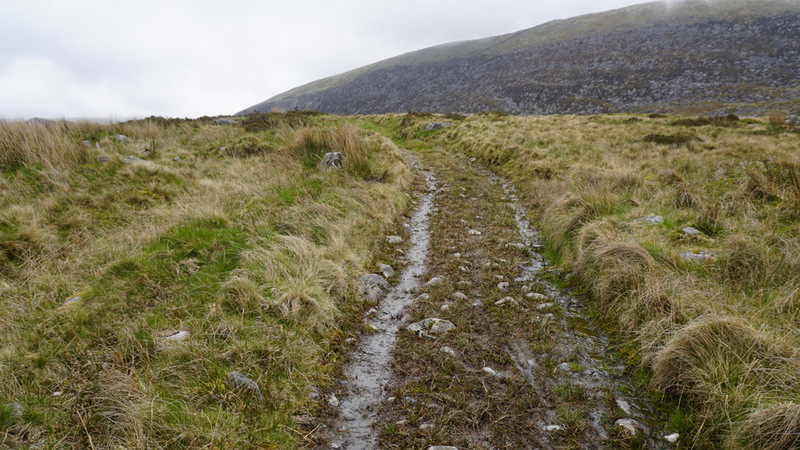 The trail is very waterlogged in places necessitating that one walks to one side of it. 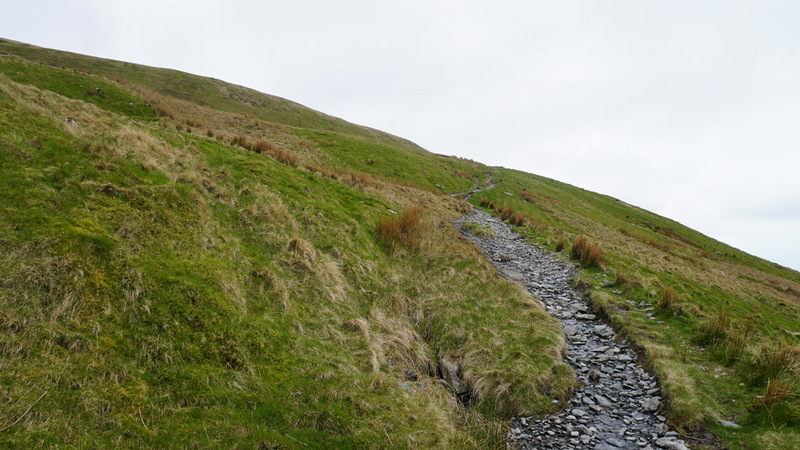 This must be a relatively long lived feature as one can make out the ‘new’ trail created by the passing of many feet trying to avoid the water. I’m finally of the last stage of this leg. If I bump into a major stream in amongst the trees up ahead, I know I have gone too far! 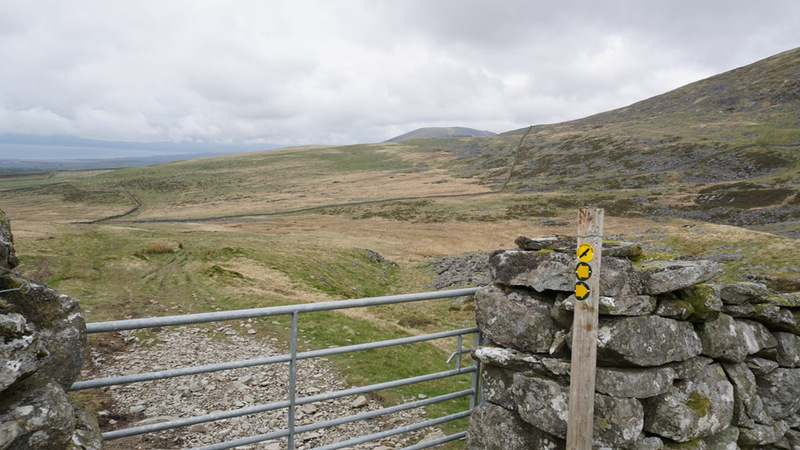 🙂 In theory there should be a turn off to the right to take me up to the Llyn Irddyn tarn. The right hand turn makes an appearance right on cue. It is even well sign posted! 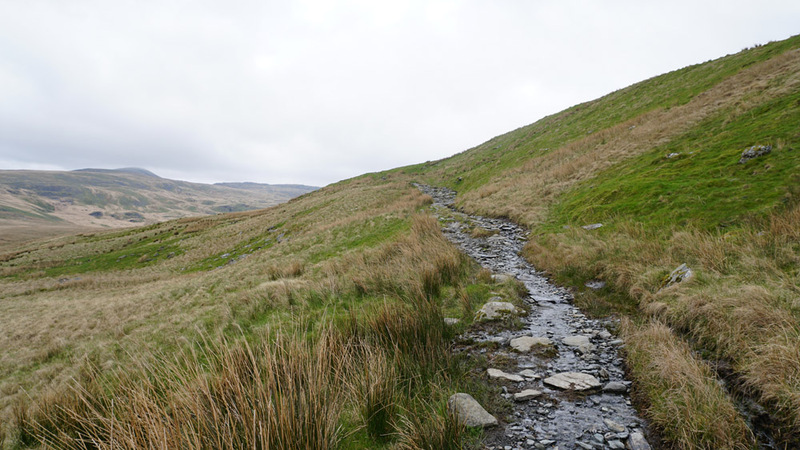 I now start the ascent up to the tarn. At this stage I am now acutely aware that there is something wrong with my feet. I guess the up hill walk is causing the rear of the boots to rub more heavily on my heals. 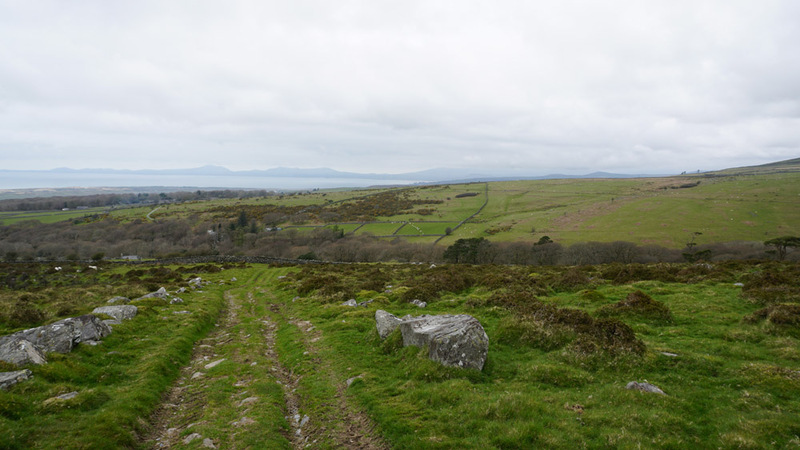 To the North I get some great views onto Moelfre. Things are now starting to feel more wilderness like. As I climb up I’m a little disappointed that the tarn is out of view. In my minds eye I kind of imagined seeing it on my right as the trail wound past it. Overall it was strange knowing it was there, but not being able to see it! 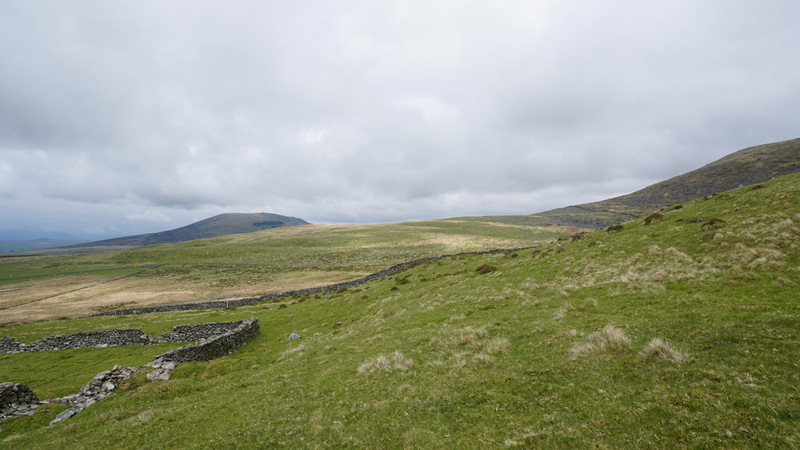 The view to the North West. 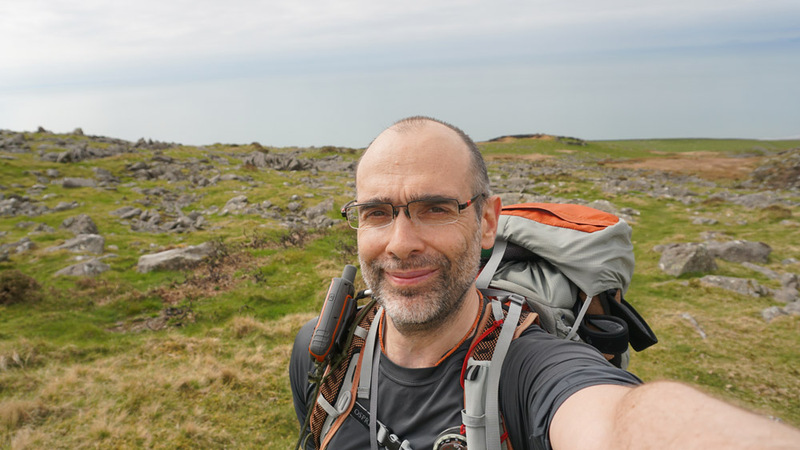 This is what day 1 was about – getting me into position for the wilderness-proper so that day 2 would be a cross country wilderness extravaganza! To my right there is still no sign of the tarn. 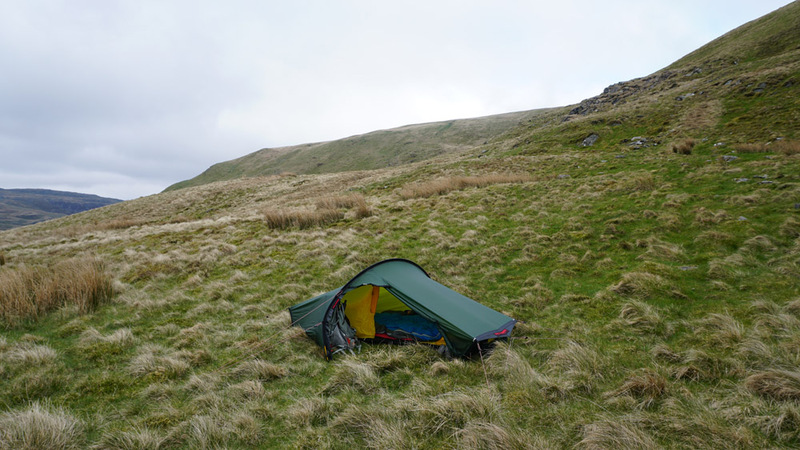 The original plan had called for me to camp by it, but instead I decide to camp higher up the hill to stay out of the way of any casual wanderers! Back on with the trail. 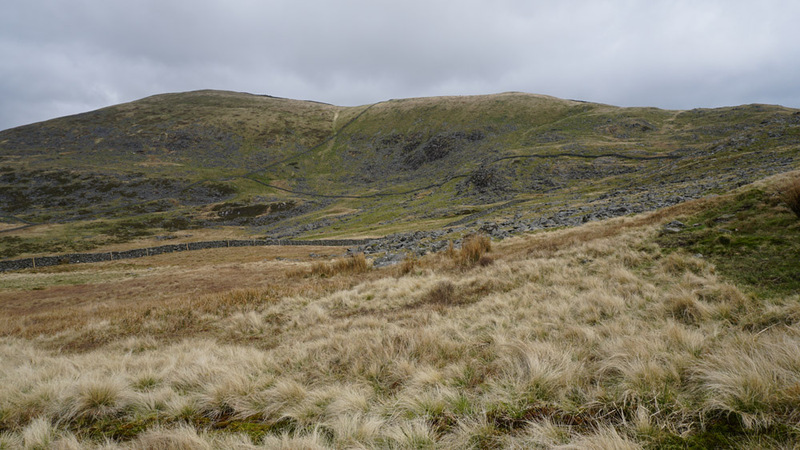 This section takes me to the highest point alongside the tarn at 320 mtrs. 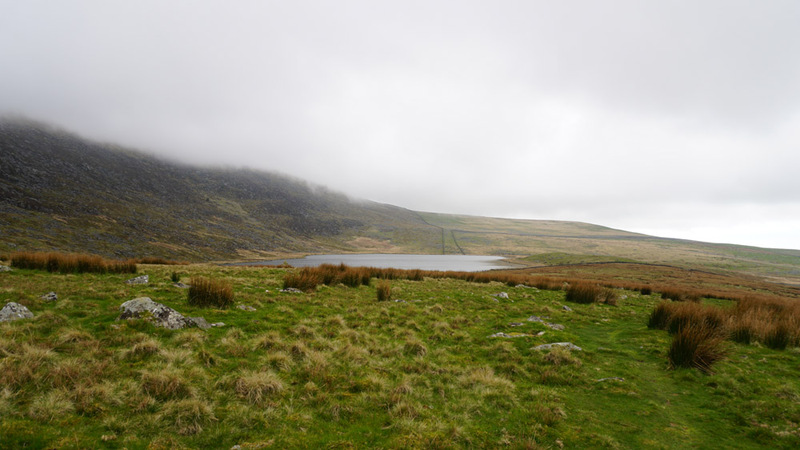 Surely the tarn will be visible when I reach the top? Alas not. No sign of the tarn whatsoever. Rather than potentially miss out on seeing it, I decide to go for a short off track jaunt up the embankment to view it. I almost regret the diversion as it proves to be extremely painful to my heals. I’m now back on the trail. 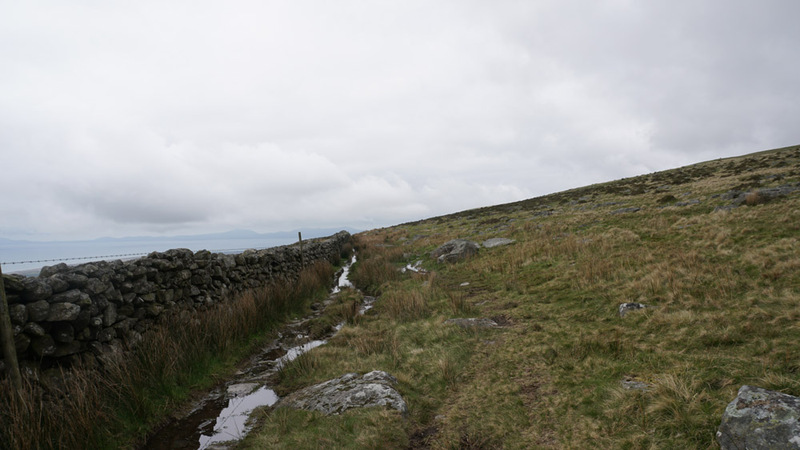 Although the weather seems to be closing in, I elect to stop for a late lunch break at the next stream to give my painful heals a rest prior to the ascent of the hill. 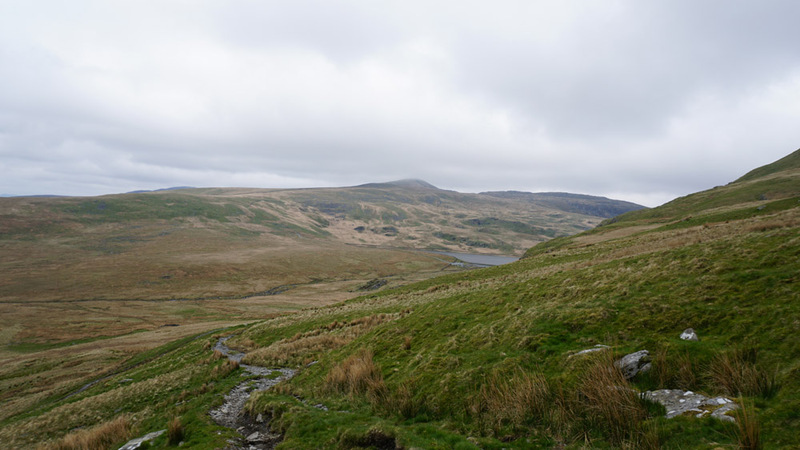 The view behind me onto the tarn. This is the second to last wall before the hill climb. 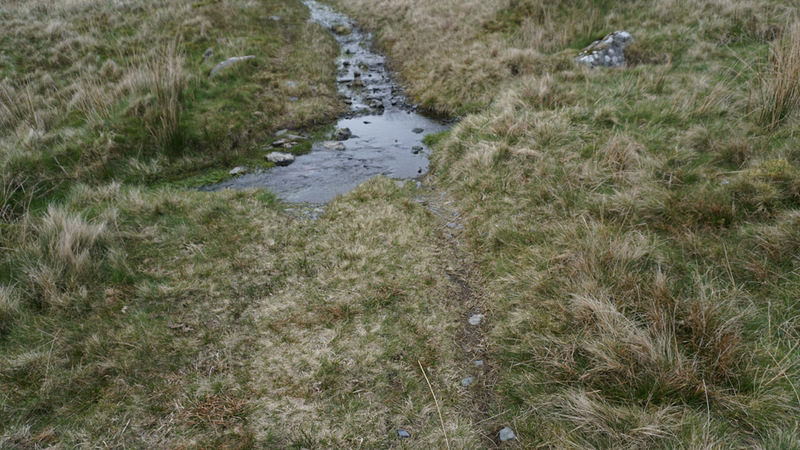 There should be a stream approximately 100 mtrs further on. This will be my lunch spot. Up until now I have been climbing the gates, but my heals are so painful that I’m now going through them instead. I reach the second stream which even has a good seat in the form of a boulder on the left – the ideal lunch spot! The late lunch consists of cheese spread, oatcakes and mulligatawny soup. 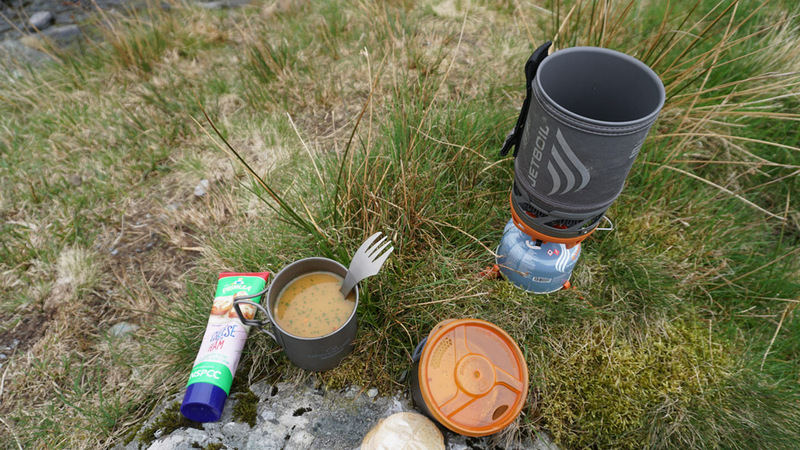 I always prefer to make lunches near a water source as it means I don’t have to worry about the water consumed to make the soup. It also provides a means to clean up the cup afterward. The view from my lunch spot. Not too bad. However, I’m not really taking in the view. Instead, I’m thinking about my heals and wondering why they were so painful. 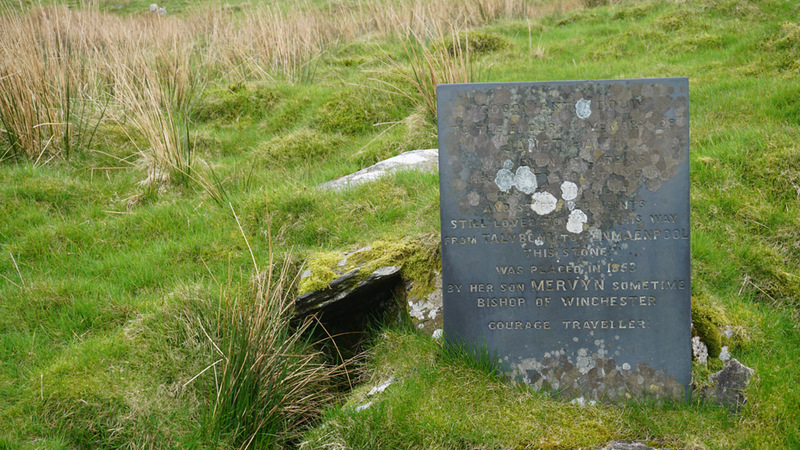 On the way up I find this stone in memory of Janet Haigh. 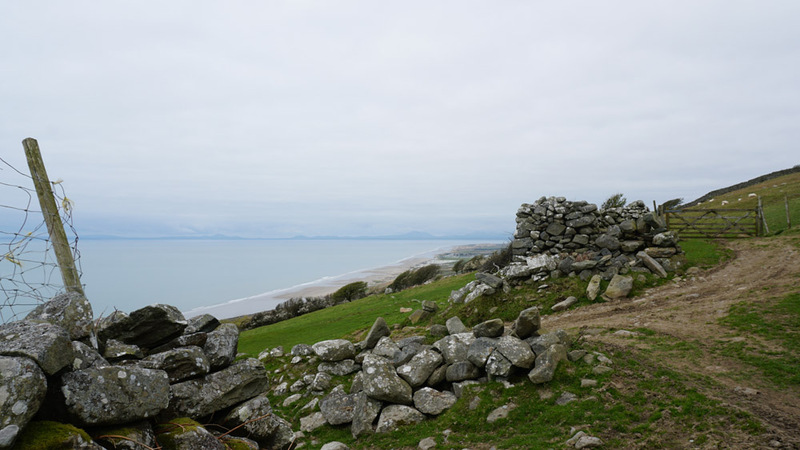 Apparently she was a keen walker and really loved this route – she was even walking it at a spritely age of eighty four! I’m now on the ascent proper. Given the state of my feet I elect to stop and make camp at the first opportunity. The track is an odd one in that it is a hybrid of a track and a stream! As I ascend I start to get some great views down the valley toward the coast. 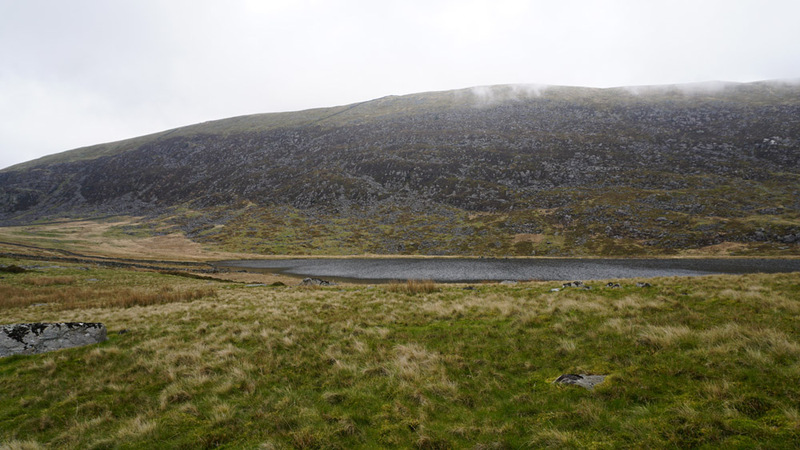 Further elevation reveals part of the Llyn Bodlyn reservoir to the North. 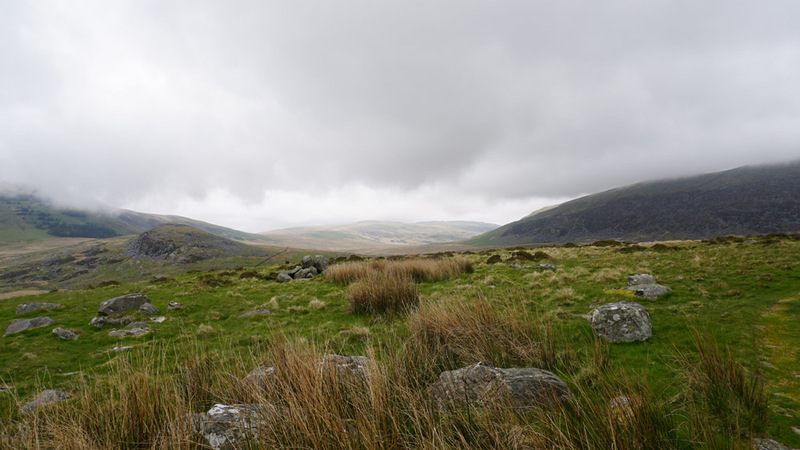 I soon get to a sheltered plateau like area. 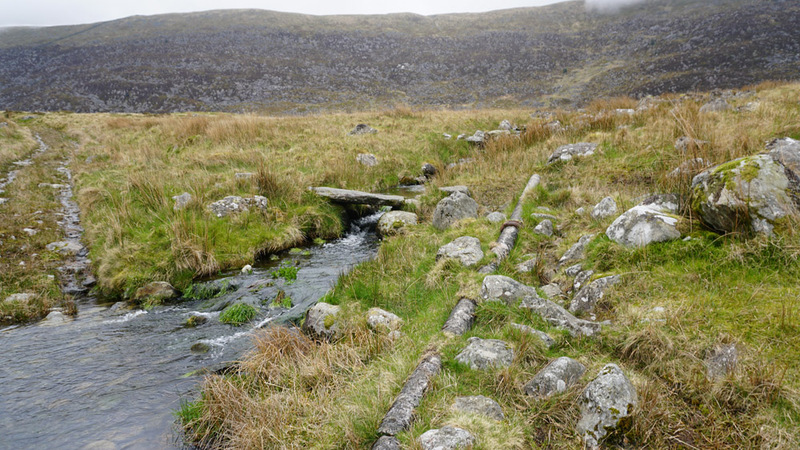 It even has a stream running through it – the perfect camp spot! After a little scouting around and some test comfort lie-downs I decide that this is the spot! Up goes the Akto tent. I have had this tent for six years and it has been bullet proof. It has never let me down – even in the worst of storms. 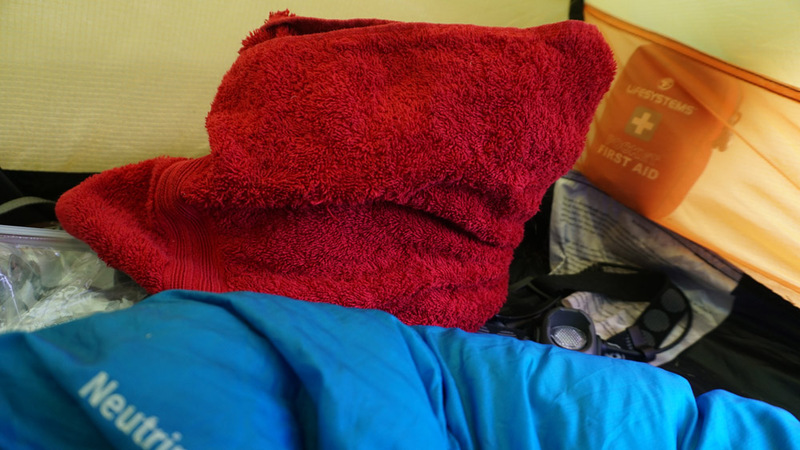 It might not be the lightest tent out there, but it’s one of the most practical. I especially like the vestibule which is large enough to hold and protect the rucksack from the elements. 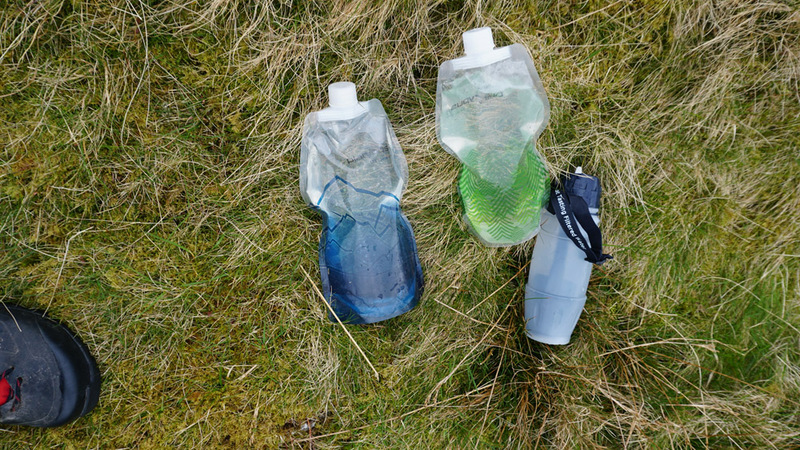 As is usual, the first job after the tent is up is to fill up all my bottles with filtered water. This allows me to make meals and have many drinks without having to worry about going back to the stream. 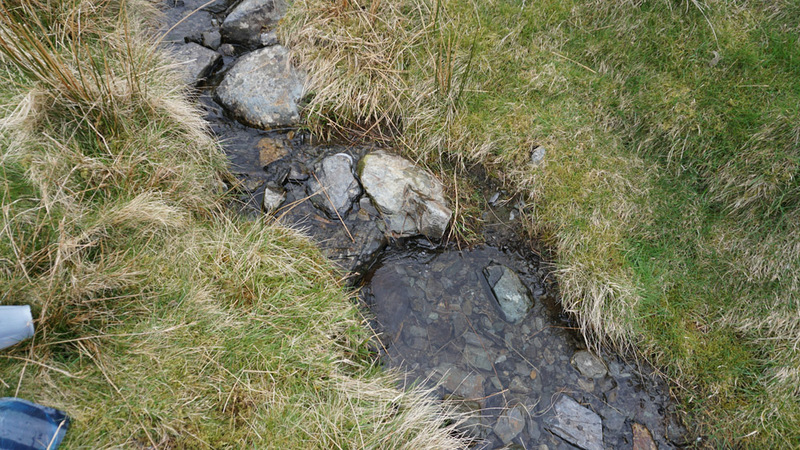 The stream is very shallow and there is only one real place where one can top up one’s bottles. 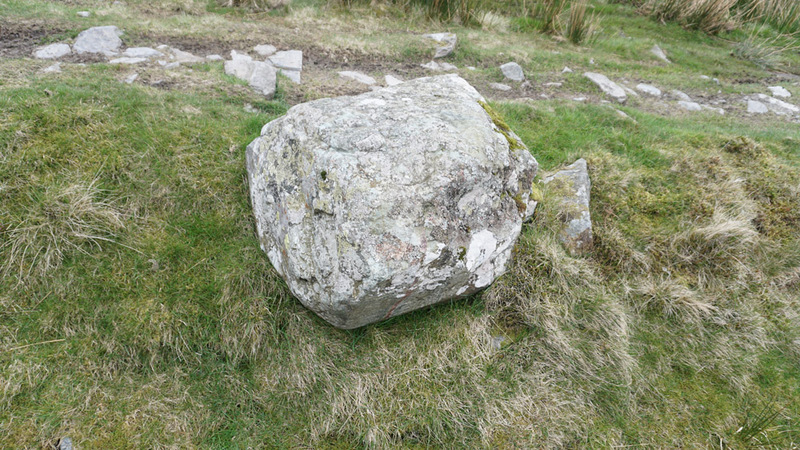 Luckily, this distinctive boulder is nearby. This will allow me to easily relocate it tomorrow morning prior to that days walk. It takes a while to filter all the water, but when out and about one rarely has any time pressures. This water probably doesn’t need filtering, but I take no risks, especially as I am travelling alone. I get back to the tent and decide to inspect my feet. This is the left one. I can’t believe that they got into this state after only 12km! At least I now know why the walk has been so painful! The right foot faired no better either. Both feet are very painful. I have plasters, but decide to let them air in the hope the blisters would dry up and harden up ready for tomorrow’s walk. Alas, this does not prove to be the case. The view from the tent is pretty good. I don’t normally camp high up as water can be an issue. But here, it’s not a problem! Time to get the meal on. This trip used the last of my Mountain House supplies. A recent internet check shows that these are no longer available in the Uk This is a shame as I really liked their meals and you can buy them in large portions. To make the meal all I need do is add boiling water, stir and then leave for 10 minutes. I’m always concerned at the amount of water one has to put in (550ml). It always seems like it is too much, but over the 10 minutes the ingredients absorb a lot of the water. Once the boiling water is added, I tend to wrap the meals in a towel so that they retain a lot of their heat during the 10 minute wait for the food to reconstitute. 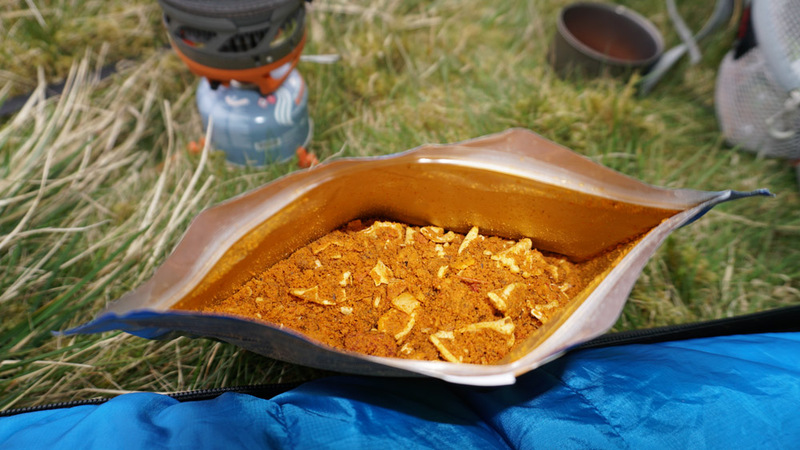 After 20 minutes – voila one hot meal! This one is a lasagne flavoured pasta. Trust me, it tastes a lot better than it looks! 🙂 After the meal I turn in for an early night. Day 1’s camp spot was a good one. Up and out of the way with a good view and its own water supply! Day 1 ended with concerns about my feet. I decided not to make any rash decisions. Instead, I would wait for the morning and see how they felt. Tune in for the next instalment to see how that decision went! 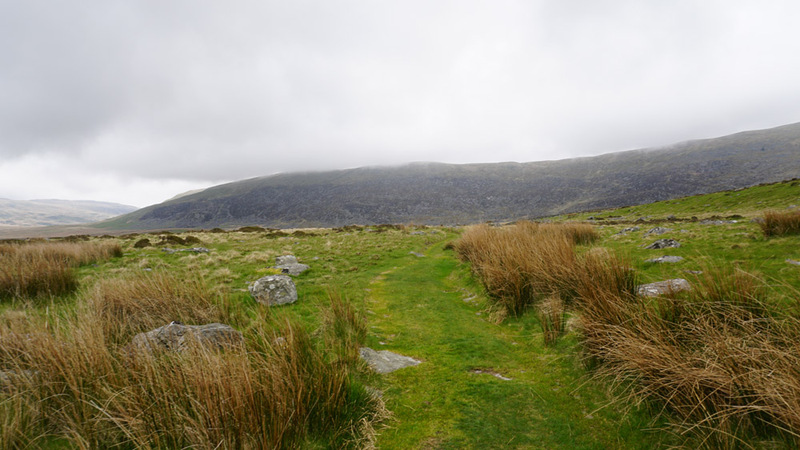 This entry was posted in Backpacking, Camping, Hiking, Multi-Day Walk, Snowdonia, Wild Camping and tagged akto tent, Cardigan Bay, hiking, Wild Camping. Bookmark the permalink. Good write up. I like the commented pictures and mapping method of describing a day. Works well. I think the green path lines are the legal route, as shown on the definitive path map, and the dots show what people really do. Your heels look painful. Airing them is a good idea, particularly if you have Compeed to apply before the next lot of walking. 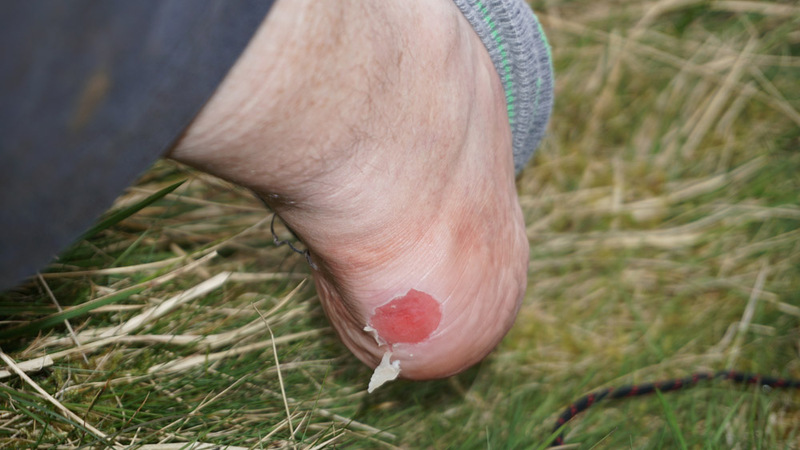 I managed to skin my heels with new Inov-8 shoes a couple of years ago, after they got wet, but the Compeed managed the pain so well that I was able to complete my trek – another fourteen days. Yes you are right about the green lines. I think that for hiking the maps would be a lot clearer without them. I wish I had some compeed to hand, but all I had were plasters and a few field dressings. One thing for sure, I will be buying some. I can handle a continuous pain as that can be tuned out, but my blisters were creating shooting pains every time I put a foot down. 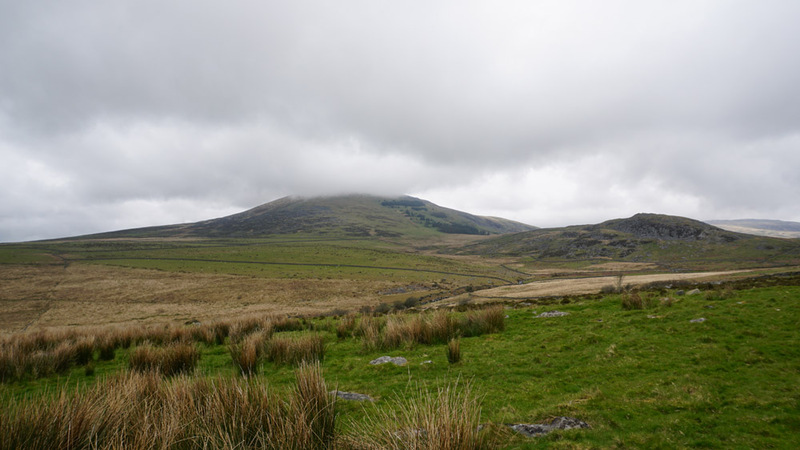 Fourteen days – that’s one large trek! 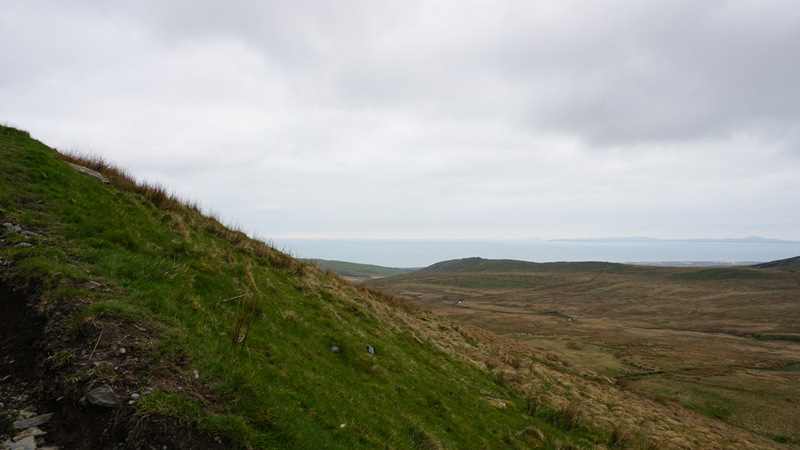 Were you doing the Scotland coast to coast? 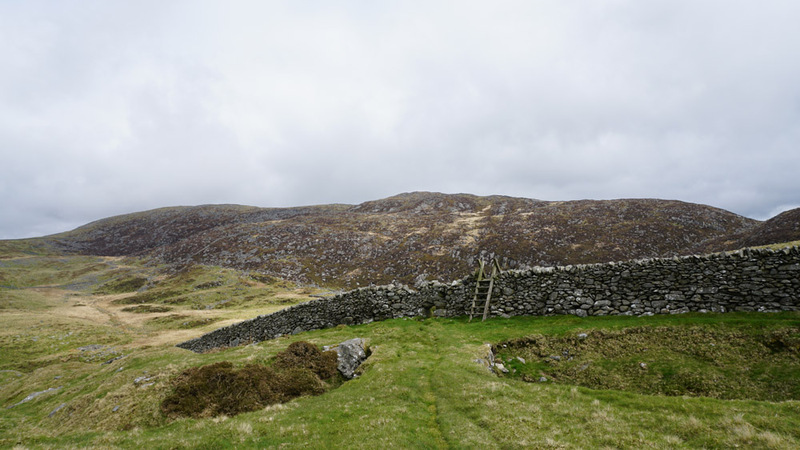 I hiked from Kintyre to Cape Wrath with a time out after reaching Ft William. 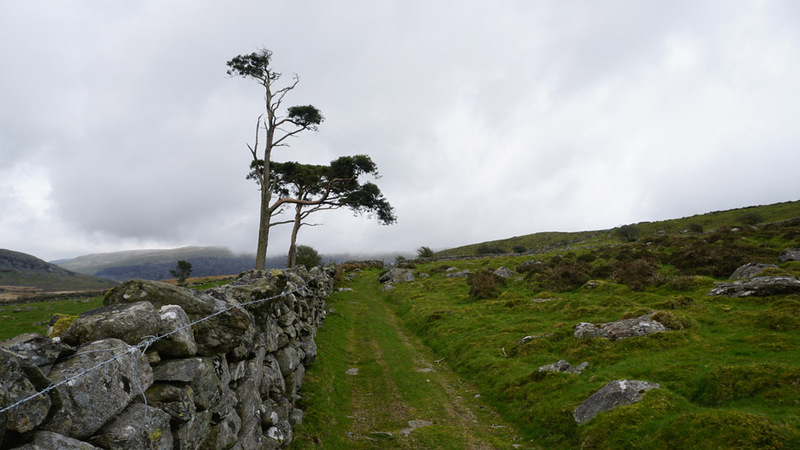 My route used the Kintyre Way, The Cowal Way, part of the West Highland Way and then the Cape Wrath Trail. Superb hiking and highly recommended for anyone who has the time. 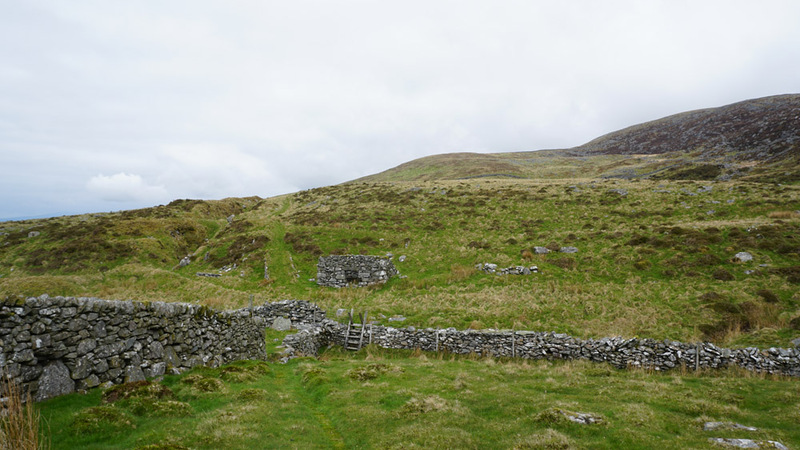 Hiking to Ft William took 16 days and then, after going home for a short break, because it was cheaper than rest days en route, I needed nearly three weeks to get to Cape Wrath. I skinned my heels on Day One and used duct tape to get to Campbelltown on Day Two, where the excellent chemist recommended Compeed. It was the first time I had ever used it and I was very impressed. Throwing the Inov-8s into the washing machine broke them in. 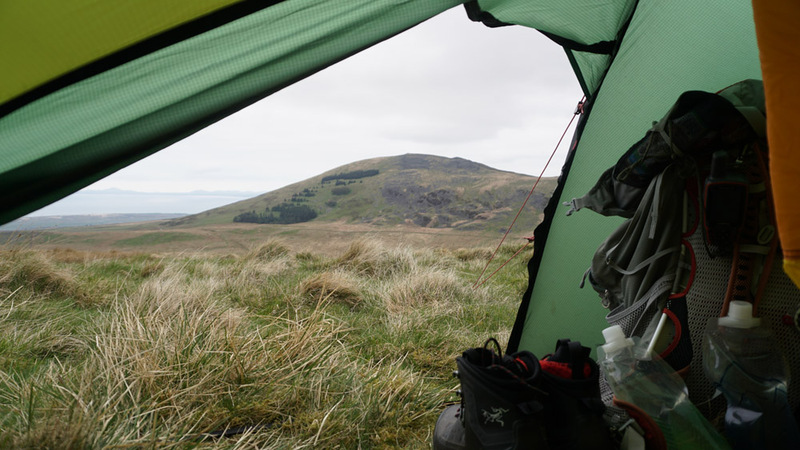 They gave no problems on the Cape Wrath Trail, although Alex Roddie had problems with his. That’s an impressive hike. Much further than I have ever gone. 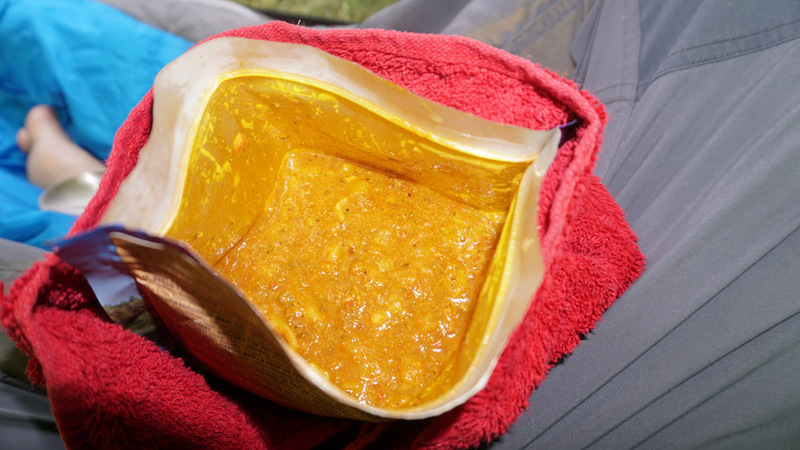 If you were carrying food for the full 16 days your rucksack must have been pretty heavy! I will definitely be stocking up on compeed. 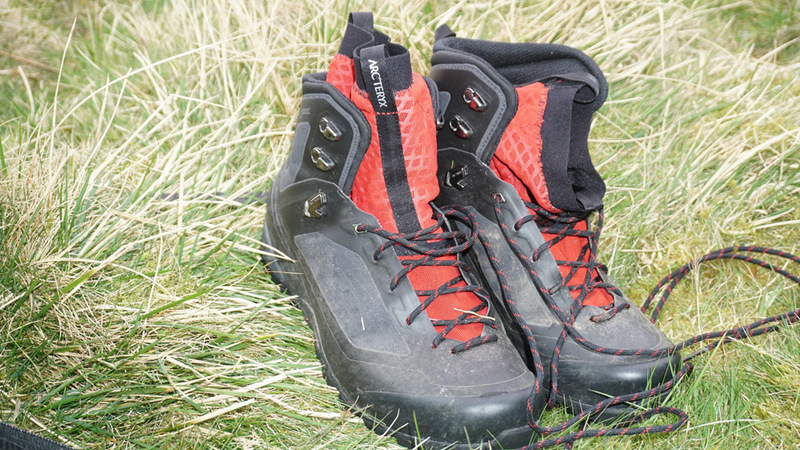 That said I’m also going to buy another pair of Salomon Quest 4ds. Although they leak like a sieve, I’ve never had any blisters or hotspots from them.